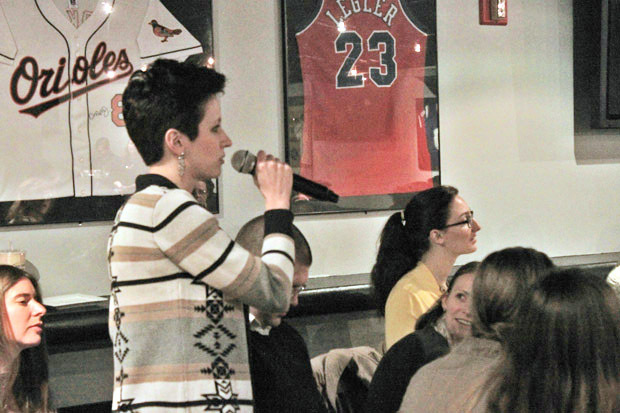 A young woman asks the priest panelists a question at "Stump the Priest" March 25 at the Field House in Philadelphia. Father Tom Whittingham (center, with microphone) has fun answering questions along with other priests, from left, Fathers David Friel and Sean Bransfield. Also on the panel was Father Joseph Bongard. Father Tom Whittingham came across an idea called “Stump the Priest” in which young adults ask questions pertaining to the Catholic Church, especially hot-button issues on church teachings and how to evangelize fallen away Catholics and anyone. 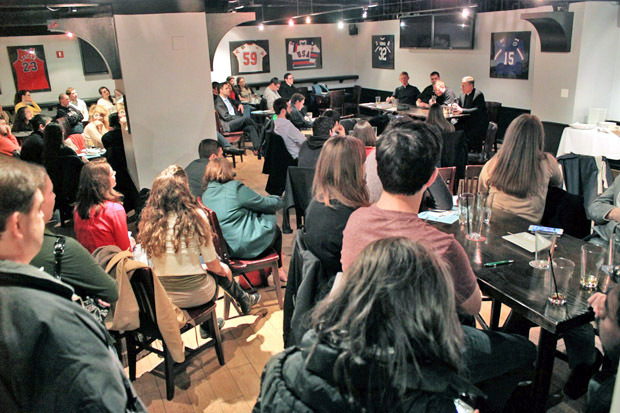 With the help of some brother priests and Meghan Cokeley, director of the archdiocesan Office for the New Evangelization, Stump the Priest was held Wednesday night, March 25, at the Field House, a bar in center city Philadelphia. Along with Father Whittingham, who is parochial vicar at Mary Mother of the Redeemer Parish in North Wales, were Father Joseph Bongard, rector of Roman Catholic High School; Father Sean Bransfield, dean of formation at St. Charles Borromeo Seminary and Father David Friel, parochial vicar at St. Anselm Parish in Northeast Philadelphia. The inaugural event drew about 100 young Catholics from various young adult groups throughout the Archdiocese of Philadelphia. Questions were submitted by email and in person before the start of the event. One question that almost stumped the priests was the appropriate age to receive the sacrament of confirmation. “High school is best for Catholics to be confirmed,” said Father Bongard. Father Whittingham pointed out that many people consider confirmation to be a kind of graduation, a one-time event, yet “people should be engaged with their faith beyond receiving the Holy Spirit,” he said. 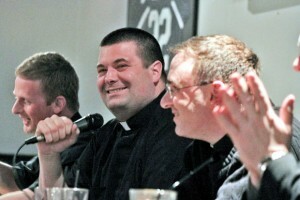 As the evening got more interesting, the priests tackled an inquiry regarding married priests. A discussion among the group arose about the decline in vocations to the priesthood and religious life. Some cited as a cause the rise of secularism in the western hemisphere, particularly in the United States. Others pointed to the breakdown of the family structure as contributing to the fall of religious life as well. The good news, as Father Friel put it, is that “no vocation is greater than the other. It is a gift from God,” he said. Father Friel also suggested a remedy to the weakening of faith in Jesus. Father Bransfield added that Catholics “are called to be more cultural.” In a sense Catholics must be willing to be “cultural Catholics” by living their faith in the secular society, the priest explained. Reflecting on the event, Father Whittingham said it was inspiring to help tackle the questions that matter most to Catholics. There was no topic that he and the other priests declined to answer. Alice Cieslak of SS. Philip and James Parish in Exton said she was blessed to be a part of the faith-filled event. She is currently a member of Catholic Young Adults of Chester County (CYACC). Cieslak sees a great need for “people truly passionate about living out their faith in their daily lives,” she said. She got a glimpse of some of those people at the Stump the Priest discussion.